If you’re not tuned in to the sports world, here’s a PSA for you: the Super Bowl is Sunday. I will fully admit that I’m just not into it this year. I’m not crazy about the teams playing. I’m over the drama of deflategate. And compared to the excitement of last year when it was held in our backyard, I’m just feeling meh about the whole thing. But, football food. Eating during the Super Bowl is like it’s own special event. An it’s all that awesome snacky stuff that’s hard to justify on a regular night. 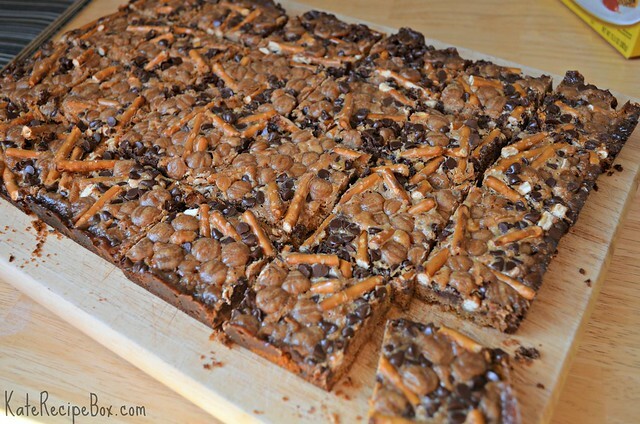 Like chocolate caramel pretzel bars. They’re exactly as indulgent as they sound and a super perfect grab-and-go snack for during the game. Or, you know, during the commercials. Preheat the oven to 350F degrees. Grease a 9×13″ pan and line with parchment. Mix together the graham cracker crumbs and melted butter until well combined and press into the bottom of the pan. Drizzle the sweetened condensed milk evenly over the graham cracker crust. Sprinkle pretzel pieces, chocolate chips and caramel bits over evenly. Press gently into sweetened condensed milk. Bake for 30 minutes, until lightly browned around the edges and starting to pull away from the pan. Remove from oven and let cool completely before removing from the pan and cutting.